Berlin; a city divided by the wall, alienated by the Cold war, an ‘outsider status‘ city clashed between west and east, had turned on itself for four decades. 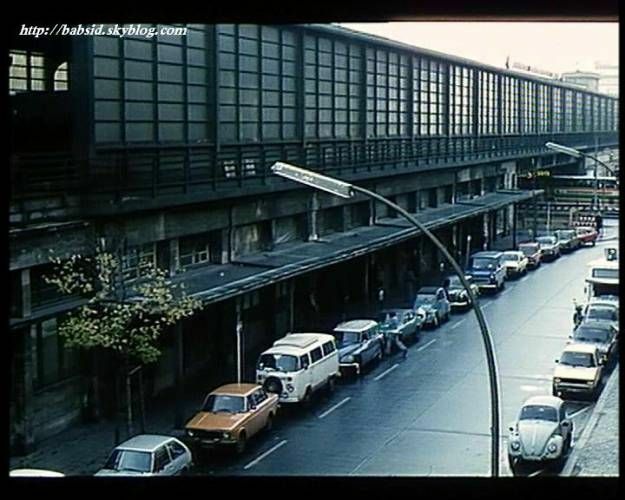 In the meantime, an alternative lifestyle was created in the West Berlin with lots of discotheques, such as the infamous ‘Sound‘, cinemas, theatres, clubs, and as a byproduct, a developed drug scene. 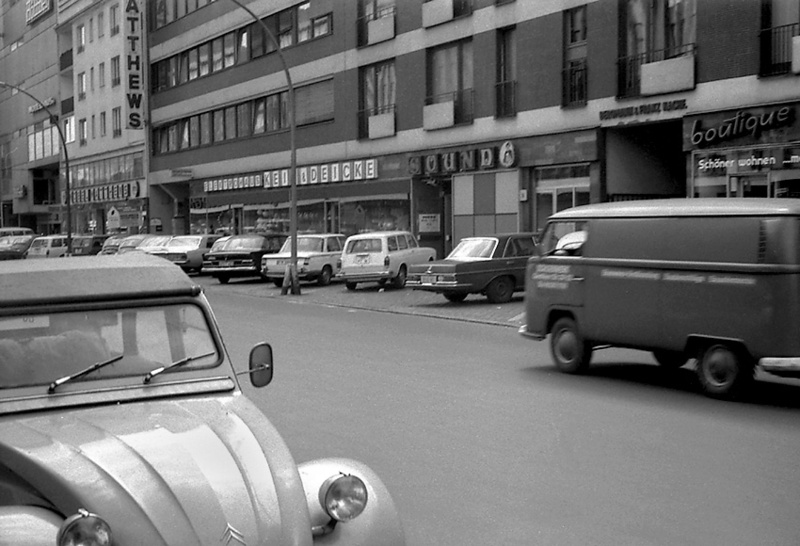 Despite the economic prosperity of West Berlin in the 1970s, living conditions, especially for young people, have not changed at all, in fact they have worsened; increasing demands at school, crowded classes, shortage of teachers, idleness and family conflicts are all specific expressions of deterioration West Berlin faced. In localities such as the infamous Gropiusstadt, settled by 45,000 people, all these problems become massive because of the vast amount of people living there, thus we have young people facing idleness, domestic violence and failures at school. Even schools, which are supposed to be motivating and joyous places, have became almost contaminated by disincentive and competitive atmosphere where pupils are just trying to be better than one another and finish off one another instead of helping each other. No sense of communion at all. There was no personal contact with teachers who were as uninterested in school curriculum as their pupils were. The classes were very crowded and the teachers didn’t even notice if someone wasn’t present at school. Alienation, which was felt by many young people who later ended up as drug-users and prostitutes at the infamous Bahnhof Zoo, began by growing up in the dehumanizing environment of Gropiusstadt. There, in that ‘concrete wasteland‘ their childhood dreams and ideals were crushed by harsh reality; there was no nature, no playgrounds, not a single meadow that children could play on. Logic of localities such as Gropiusstadt relies on cost-effectiveness and not on human needs and desires. Consequences of that artificial way of life came evident in a whole generation whose youth and childhood innocence were destroyed by the dehumanising and alienating environment. Financial adversities were the biggest problem. High rents and living expenses entailed bigger and bigger work load, on both man and women and people were in constant pressure to put more and more effort and strength into their work, without getting any true joy or welfare. Alcohol was always the first choice of substances people used to numb the consciousness of their position as victims of social progress. For Berlin’s youth in the 1970s, heroin seemed like the only solution; they hoped it would eliminate their problems and numb their senses so that they don’t feel anything at all. Children from Bahnhof Zoo were tricked for their childhoods; they found no pleasure in their present, no valuable perspective for their future, nor were they capable of drawing strength from their past. Possessing rudiments of childlike imagination, independence and self-confidence, these children just ran from one stimulation to another. Their childhood faze, with its free and stabilising possibilities of development, was reduced only to a pre-school age; and all for the account of the earliest possible orientation abilities and passive consumerism. Children from Bahnhof Zoo had nor the time nor the environment to actually be children and enjoy the carefree and playful atmosphere of that phase. While appearing emotionless and cold on the first sight, these children and drug-users were emotionally developed as a ten year old child, and, very sensitive, with a need to be loved and accepted, they went through the thick and thin of a typical drug-using career. One of Christiane F.’s best friends was Babsi who later hit the cover side of Berliner Zeit in 1977. when she died aged only fourteen. 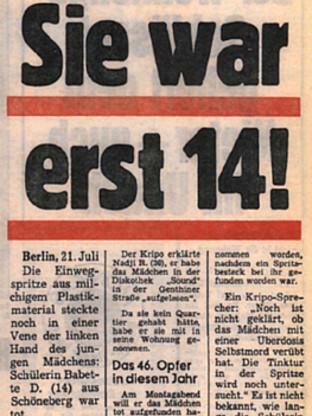 Shocking title ‘Sie war erst 14!‘ lifted the veil from what was previously a tabu topic; drug scene in Berlin. Babsi was the youngest drug victim in Berlin, and her death, along with the publication of the book Wir Kinder vom Bahnhof Zoo helped in raising the awareness of the increased number of teenage drug users. Teenage drug users aren’t very emotionally strong, as I’ve said, and they wave between their romantic fantasies and dreams about ideal world and the manner of behavior of adults who struggle for survival. Despite the hard living conditions these drug users, aged between 12 and 16, face in confirming themselves on the ‘scene‘, they are on the emotional level of a small child. These young people have seen through the system and society for what it was; a cruel place with hopeless, neglectful and competitive atmosphere, where the individuals are led by greed and hatred, and the society in general, that has lost its moral values, is in a state of anomie. In the clash between the dehumanizing living environment and consumerist false values, these young people felt trapped in the petty-bourgeois monotony. Young people came to the conclusion that, by their future financial capabilities, they’ll never have access to the wonderful, glittery world of commercials and shop windows that has fascinated and attracted them so much. It is a cognition which they formally accept, and soon start looking for the alternative ways of life, but deep down, a lot of teenagers feel bitter and disappointed that all the privileges of the consumerist society will remain unavailable to them. Also, money had became more and more important determinant of human relationships, and young people, unable to satisfy their desires, more and more controlled by money, try to find other ways to satisfy their desires. Their parents weren’t able to show them the right way for they were burdened by the demands of the Capitalistic society as well. They were burdened with insolvable contradictions themselves; with what they’ve accomplished in life and what they are yet to accomplish will never be enough to fulfill what they wished for in life, or, what they were taught to wish. At the same time, unlike their children, they didn’t give up the race so fast, they instead made their best efforts in their Sisyphus task. In doing that, they neglected life values such as friendship, family, neighbors ties, trust, confidence, willingness to help others and understand their needs. All this problems led to destruction of a family life. Social problems in West Berlin in 1970s only show the true nature of society; its hypocrisy, obduracy, materialistic obsessions and complete detachment from nature, God and true values of existence. 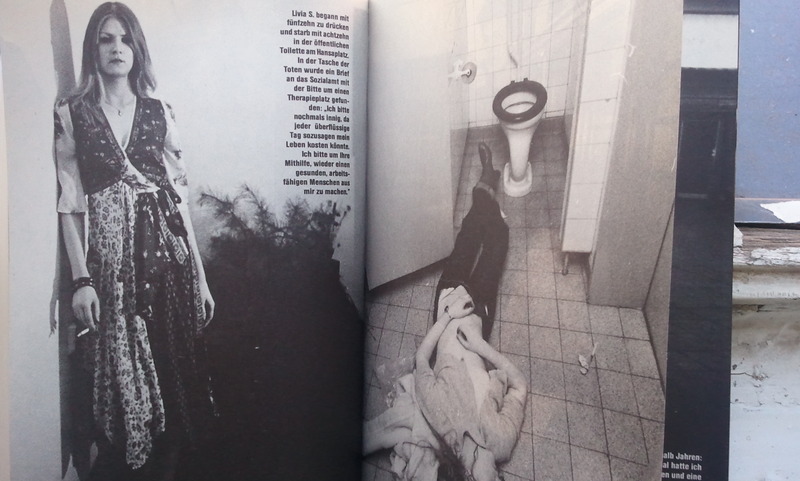 Christiane F. soon became fascinated by the coolness and seeming indifference of her peers. She did not yet knew that that coldness, inner death, with a short phase of ‘living death’ duration, the length of the lifeline of addicts, is marked by a transition from soft to hard drugs, along with the gradual deterioration of body and the collapse of consciousness. 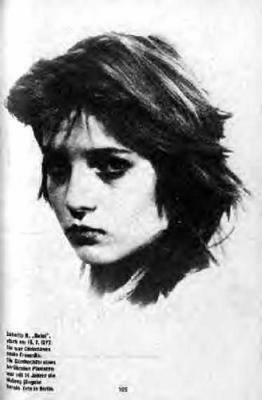 Christiane F, and many, many other young people in West Berlin, started smoking marijuana in Haus der Mitte, gradually passing on to stronger stimulants, to LSD which she first tried in the discotheque Sound and later, just a month prior to her 14th birthday, after a David Bowie’s concert, Christiane sniffed H for the first time. From that moment began her sliding into the spaces of horror; discotheques and the infamous Bahnhof Zoo; where the collapsed existences suffocate in the stench, stupor, confusion and vomit. Fatal Bahnhof Zoo with its irresistible smell of piss and disinfectants would become her natural habitat. At that time, barely turning fourteen, Christiane F. was already drawn into the heroin hell, and is acquainted with the infernal underground, composed of the sellers of death and new, fresh customers. Stretched between being a Child and a heroin shooter, Christiane already faced the world of perversions, a world of misery where the rich ones are suffocating in luxury and boredom, and the others are struggling to survive, sinking deeply into the darkness, knowing that the only way to survive is to kill all the emotions. 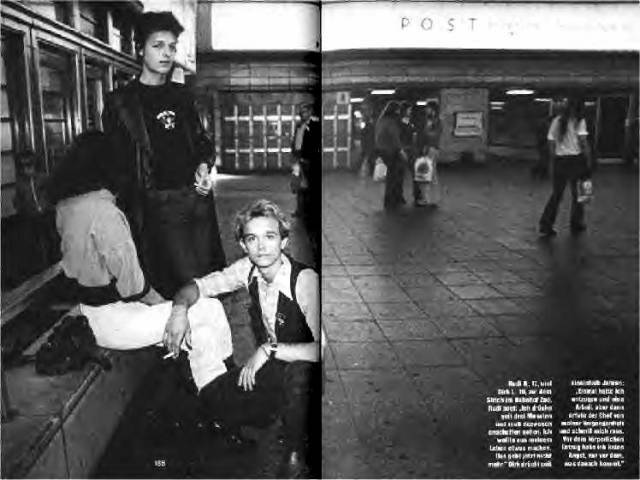 Christiane F. found herself on Bahnhof Zoo in the early morning one day, after a night spent in the Sound with her friends, and saw how unkempt and drab the station was; full of tramps and drunk man lying in their own vomit. She did not yet knew that she would be spending her afternoons on this notorious Bahnhof in months to come. Christiane’s eyes reflected nothing but fear and despair; her eyes saw the depth of their own grave, because the body of a heroin user is a bigger burden than a fourteen year old girl can take; for a body laden with pain, shooting up, cramps, vomiting and itching, becomes an unbearable burden. However, Christiane’s most painful experiences came with death of her friends. 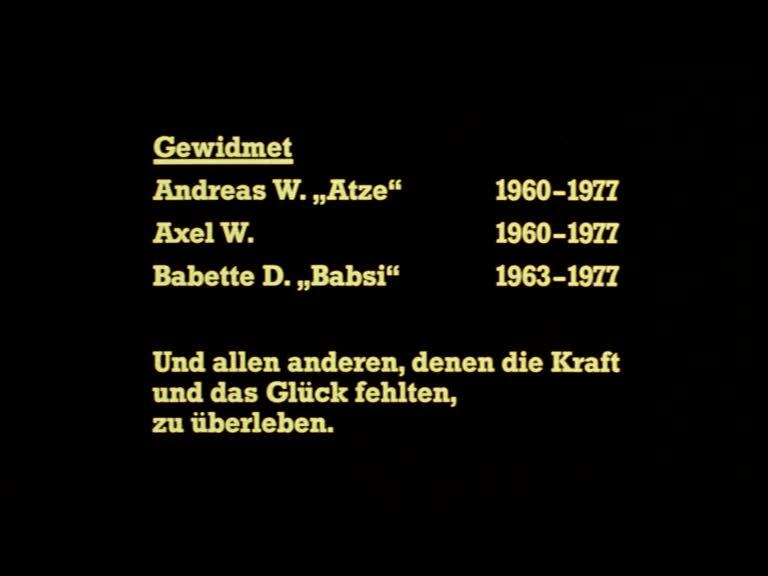 Axel and Bernd both died, Lufo, who first impressed her because he was shooting up only at the weekends, also died, her first love Atze; lying in a coffin. But the biggest shock was the death of her dearest friend Babsi D. who died aged only fourteen, as I’ve said, with a needle still stuck in her left hand. What a horrible life, death, destiny! When Christiane read the news of Babsi death, she felt like the newspapers were writing of her own death. She wasn’t clear whether she was crying over Babsi’s death or her own; her sinking deeper and deeper in the hell of drugs, into a wasteland world of apocalyptic darkness. These children took the burden of an economic development on their backs. At such a young age, deprived from their childhoods, they waved between their ideals and the struggles of life. Trying to overcome a complex of a total outsider, they were always trying to be more original, more daring and brake the conventions. Still, they realised from the early on that they’ll never be Heroes, as in a David Bowie’s song; they’ll never be something more. Seeing the life that awaits them, they protested, trying to escape to brutal world, but all in vain. Escaping the harsh and boring triviality into the world of music and drugs, they found a place to belong in places they shouldn’t have; discotheques, clubs, wandering the streets of Kudamm at night, vainly searching for that something, that essence of life that was nowhere to be found. Christiane F. said in the book that the ideals of their parents were ‘live to acquire something‘, and the thing that gives meaning to life would later come too. That something which gives meaning to life was nowhere to be found for the children from Bahnhof Zoo. 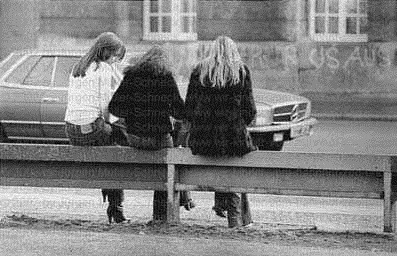 Christiane F, and her friends, were still vainly searching for the meaning. Children from Bahnhof Zoo have, on the threshold of life, seen through the emptiness, shortcomings and monstrosity of the modern society whose main characteristics are mimicry and adaptation as prerequisites for success. The society is not based on freedom and individuality, quite the opposite, the ‘damned‘ ones who tasted the bitter taste of ‘knowing‘ have realised, and succumbed to their realisations, that the world; the society is a place of alienation, emptiness, hypocrisy, the monstrous morality and great injustices. Christiane F. naturally wasn’t the only child on the Bahnhof Zoo, there were plenty of them, the number of deaths caused by heroin in West Berlin rising from around fifty in 1970. to a drastic 560 only seven years later. The first photo shows Christiane’s love, a young lad Detlev who was in prison in Moabit at the time photo was taken. He still dreamed of a civil life with Christiane; his dreams and ideals being the only things he had. Second photo shows Babette ‘Babsi‘ D; look at those eyes, how sad, disappointed they are, full of fear, resignation and despair; eyes darkened by the depth of its grave. Fourth picture shows Christiane’s first love Atze who deliberately overdosed in 1977. aged only seventeen. He killed himself because he considered his life to be immaterial, with drug users only bringing troubles and worries to their loved ones. The tragedy of his death did not stop there for his girlfriend Simone, only sixteen years old at the time, soon quit high school and hit the streets; shooting up and earning the money on Bahnhof Zoo. She slit her wrists soon after. Fifth picture shows Christiane’s other friend, Stella, for ended up in prison aged only fourteen. And the last one shows some other girl from Zoo, Karin. The picture above shows Rudi, 17, and Dirk, 18. at the Bahnhof Zoo. They started shooting up aged fifteen, and feel hopeless about their future, even though they want to overcome their heroin addiction and find the meaning of life. 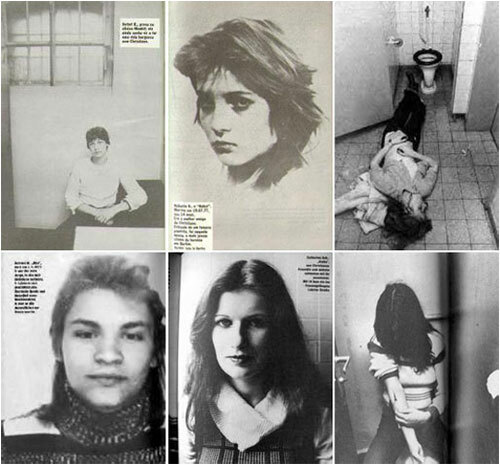 The photo above show Livia S. She started shooting up aged fifteen, and died aged eighteen in a public toilet on Hansaplatz. A letter written to a social welfare office was found in her pocket, begging for a rehab therapy. ‘Every day may cost me my life.‘ And it did, sadly. Life is such a fragile thing, if you think about it. Livia was so young, still blossoming into the adulthood, with dreams, desires, memories, wishes, hopes; all crushed in a moment, in a dirty toilet. Sad end to an even sadder life.